Innovation - can following a process help? Working in the creative industry, I have asked myself the question, what makes a great innovator? What can I learn from great creative minds like product designer Dieter Rams or illustrator Jamie Hewlett? Can innovation follow a standardized approach or does it stifle creativity? In design there are two approaches: To play safe and give the client what they are looking for, or to take the risky approach of recommending something different. Innovation however is not a question of preference. After I worked with great thinkers and read a lot on the topic, I can confidently say there is no set of principles that makes a great innovator. But there are certain aspects that many innovators share. Design thinker Diego Rodrigues created 21 design principles, one of which says: "If experiencing the world firsthand is about wisdom, then being open to what that world tells you requires cultivating the un-wise mind of a child: open, curious, fun-loving." This is very true when you consider that most innovations were the result of unexpected discoveries or serendipity as it's called. But serendipity or openness doesn't exclude knowledge. Openness is also about knowing what you don't know. Louis Pasteur stated: "In the field of observation, chance favours only the prepared mind". In a professional environment there are two approaches to creative thinking: Through tried and tested processes (waterfall approach) or through flexible thinking (agile approach). As innovation adviser John Kao in a article by the New York Times said: The rigor of "training and discipline on one side and improvised creativity on the other" are like the Yin and Yang of innovation. An old saying states that cars don't have brakes to slow you down, they have brakes so you can drive faster - more safely. In other words, processes are generally in place to provide us with certainty and confidence. The advantage of the waterfall approach in project management is that it is highly structured and controllable. The steps normally include research, followed by outlining requirements and design. The last step is implementation or development. Effective processes enable nimble executions, predictable delivery and risk-free business growth - in theory. Practically, this is an arguably difficult approach to nurture innovative thinking. For example too much research can stifle creativity, too little may result in a lack of direction. Henry Ford opposed the idea of research completely and famously stated: "If I had asked people what they wanted, they would have said faster horses." An alternative to the constraints of process-driven approaches is agile thinking. Working collaboratively and flexibly is very dynamic. The advantage of the agile approach is that it allows for changes to be implemented more quickly. It is based on a network structure and is less hierarchical. And yet, due to its flexibility it is more difficult to control time lines and costs. Rodrigues argues that the best design strategy is to meet at the intersection of a user's desirability, the business viability and the technical feasibility. 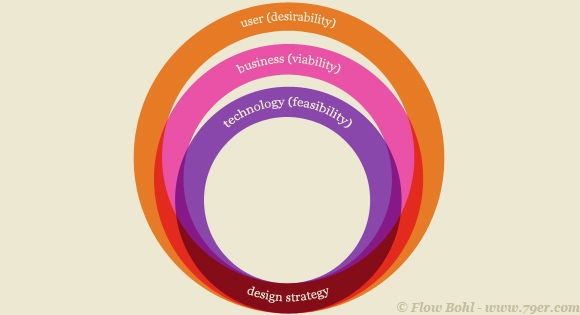 These three pillars desirability, viability and feasibility are present in many creative fields. In economics a desired financial outcome is useless unless it's politically feasible. Equally in architecture, where a property company's viable aims of an office block may not meet the needs of the people using the building. The solution? Innovator Jose Baldadia suggests: "Why not start off with a wide range of unconstrained ideas, then together with the sound specialists, refine the result to be both graceful and effective?" Unconstrained ideas are a good starting point to intuitively form initial assumptions. Experts can then provide rational thinking for finding evidence in an idea's feasibility and viability. Striking the right balance between process-driven approaches and flexible thinking is probably the best option. Silicon Valley's technology forecaster Paul Saffo observes, "successful innovation requires an odd blend of certainty and openness to new information. In other words, it is a blend of top-down and bottom-up discovery". It's like thinking outside and inside the box at once. Thinking inside the box is important because only then the value of thinking outside the box becomes apparent. Design graduates and untrained staff unfamiliar with the boundaries of "the box" have often great ideas that are truly innovative and challenge conventional thinking. The problem with thinking outside the box alone is that it is very hard to sell. It requires someone who is familiar with conventional thinking to provide rational arguments as to why a new approach could work. 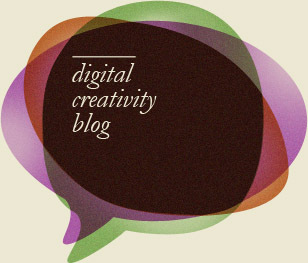 "Creativity and design thinking is nothing without a business model to take the ideas generated to market. And a willingness to get out of the building as soon as possible to test the ideas" (Graham Hill). What is your experience? Do you follow standardized approaches? Please share your thoughts and leave a comment below. Form or function, what matters more? Are Unclicked Online Ads Wasted? No glorious future for Flash?